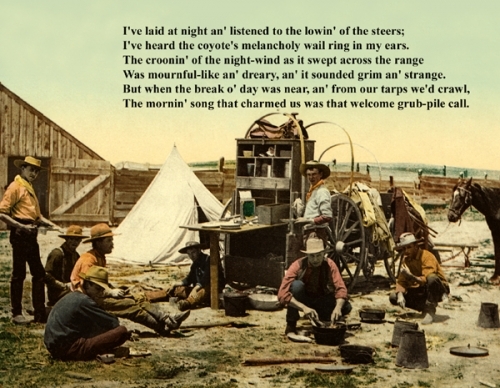 Grub-Pile Poem Postcard - Custom original only available at Legends' General Store. Text on Front: I've laid at night an listened to the lowin' of the steers; I've heard the coyote's melancholy wail ring in my ears. The croonin' of the night-2ind as it swept across the range Was mournful-like an' dreary, an' it sounded grim an' strange. But when the break o' day was near, an' from our tarps we'd crawl, The mornin' song that charmed us was that welcome grub-pile call. Text on back: In the days of the Old West, the call to a meal was one of the sweetest sounds heard to the cowboys, who had traveled miles across the range. The most beloved man on the cattle drive was the camp cook, referred to by various names including biscuit roller, coosie, dough belly, soggy, sour dough, and dozens more. Postcard is brand new and in mint condition.